According to the Small Business Administration, 50 percent of small businesses fail during the first five years and 66 percent during the first 10. I feel blessed to say I’ve been in the self-development industry for nearly 14 years. Before becoming a speaker and author, I was in the entertainment industry for 11 years. It doesn’t matter if you’re a business owner or employee, keep reading. The approach to maintaining your staying power is applicable at work and in the marketplace. Outside of praying, these are the two essentials I do to ensure my brand doesn’t vanish and my business doesn’t fail. I stay relevant by watching how the market is moving and decide what role I want to have in it. This often requires a redesign of my brand. For example, in 2005 I was an image consultant, motivational speaker, author, and columnist. Around 2007, I dropped the title image and replaced it with branding. My first presentation on branding was at the University of Delaware. It was an audience of about 300 people. From that presentation, Bank of America called for me to present on the topic and the rest is history. Note: I did more than change my title, I’ll share that in another communication. The second most important decision I make to keep my business on a continuous incline is building significant, influential, and mutual partnerships. 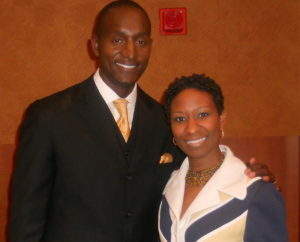 My first partnership was with Dr. Randal Pinkett. He’s the owner of BCT Partner, a multi-million dollar research, consulting and training organization. You may remember him as season four winner of The Apprentice. The goal was to collaborate with a powerhouse name for added credibility while diversifying my portfolio. In return, he got a reliable brand. As I expanded my brand and grew my business, I received a call from Steve Harrison. He’s the marketing mind behind launches of Chicken Soup for the Soul, Rich Dad Poor Dad, and Men Are From Mars Women Are From Venus. He was creating an online Speaking for Money Program and looking for six proven speakers with established brands. The founder of Chicken Soup for the Soul Jack Canfield and I were among the six. Being on his platform of over 60,000 people significantly increased my brand’s visibility. After recording the program, he extended an offer to coach his clients. I accepted. For five years, I help hundreds of speakers and authors clarify their mission, craft their message, and assess the value of their brand. And the intellectual property I offered in his online program led to an unexpected call to sign my first book deal with Wiley. What did he get? A bankable brand that helped grow his organization by helping his client create results they were seeking. Today I’m partnering with the Society for Human Resources (SHRM). I’m with their Speakers Bureau, speaking at their annual conference, and we continue to have ongoing conversations about additional ways to partner to make workplaces better and serve their 300,000 members. Build a bankable brand. Astute business people make critical decisions every day that advance the strategic plan of their organization. Having a track record of continuous growth and success signals, you’re likable, marketable, and credible. Communicate Your Value. Craft your message that communicates who you are and what you do in a way that pique’s interest to want to know more about you. It should be clear and concise with an appetizing value proposition. Package, Position, and Promote Your Brand. Before there was ever a partnership offer, there was a reputable, relevant well-packaged brand. I met Randal at a speaking engagement. He spoke in the morning, and I spoke in the afternoon. Being on the same platform, leveled the playing field and created an opening for conversation. I came in contact with Steve at one of his workshops. When he called three years later, he said, “You are unforgettable.” I knocked on SHRM’s door. Remember, before there will ever be a partnership, there has to be a bankable brand. 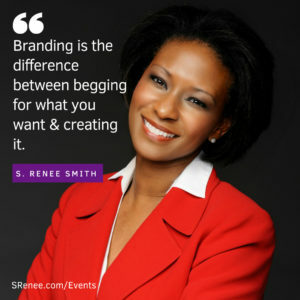 S. Renee is a nationally recognized Self-Esteem, Branding, Communication, and Executive Presence Expert, Speaker, and Coach. She is author of There Is More Inside: Personal Essentials to Living a Power-Packed Life, The Bridge to Your Brand: Likability, Marketability, Credibility, Our Hearts Wonder: Prayer to Heal Your Heart and Calm Your Soul and 5 Steps to Assertiveness: How to Communicate With Confidence and Get What You Want(Callisto, 2018). She is the co-author of Self-Esteem for Dummies (Wiley, 2015). 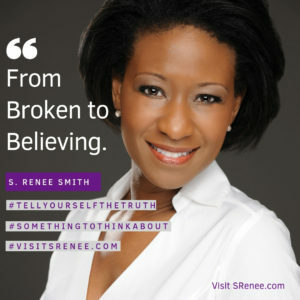 Visit her website at www.srenee.com. Are the Risks Too High or Your Confidence Too Low? Last week I announced I’ll be speaking at SHRM’s national conference. I’m presenting Powerful Leaders: Transform Your Personal Brand and Executive Presence and Defining and Communicating Your Personal Brand to Increase Your Visibility, Credibility and Career Opportunities. SHRM hosts the world’s largest HR conference. I hope you can attend. My journey isn’t about inspiring others by elevating myself. I’m about challenging you and providing you with the insights you need to grow your confidence, courage, executive presence, and brand so that we can experience greater success– together. Where are you in relation to where you want to be? Pause and check in with yourself. Ask: How are you doing? Are you at peace? Are you happy? Do you have that nagging feeling you aren’t in the right place? Are you agitated? Do you have more questions than answers and more desire than self-will? Perhaps the frustration you feel during the day keeps you awake at night. It’s difficult to make decisions that you know will make you uncomfortable. I know because I face those decisions every day. To get an invitation to the C-Suite, sign a significant contract, grow your ministry or land a coveted position at an organization, requires you to do something different. Sometimes you honestly don’t know what your next step should be. 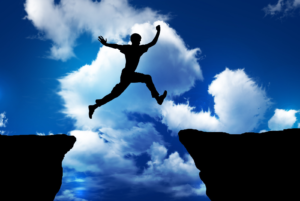 Most often you perceive what to do but will not do it because you’ve convinced yourself that the risks are too high. I’ve discovered, the truth is that your confidence is too low to pursue your desires. Can you own that? By owning truth, you give yourself the power to transform it. Over the past 25 years of my career, I’ve had the privilege to minister to people internationally, have a seat at the table in the C-Suite, sign sizable contracts, land coveted positions, and take advantage of miraculous opportunities. I did this by recognizing my internal barriers and misconceptions about people and success. And I’m still on this incredibly fun evolutionary path of checking in with myself and changing when I’m not in alignment. 1. Override the notion that it won’t work. Whenever you set out to achieve a goal, you’ll have doubts. And some of your family and friends will confirm your opinions. You’ll also have experiences that will shake your confidence. Either you believe, or you don’t. Yes, it hurts when you’re on the learning curve and, you experience failures along the way. And doggone it when you put so much time and effort into a project, and the results aren’t what you expect, it’s frustrating. You’ll question yourself. “Am I overestimating my ability? Am I on the right path? Is this the right way to go?” Keep moving forward and permit yourself to learn as you go. 2. Assess your network and ask for help. Asking for help can make you feel powerless, but that’s your ego. If you’ve built a positive brand and didn’t burn bridges, people in your network will be happy to help you succeed. Everyone loves to be acknowledged for the success of others–know who’s in your network and ask them for help. Note: You can tell who will endorse you by what they say about you. Caution: Don’t ask people you’ve met in passing to vouch for you. They don’t know you, and you shouldn’t put them in an uncomfortable position. 3. Don’t compare yourself to others. I almost didn’t write my first book because when I compared myself to others, I didn’t think “I had a story.” I doubted myself, my value and ability. If I hadn’t written the first book, I wouldn’t have served over 100 clients across nine industries, written two additional books, signed two book deals, coached hundreds of clients to success and share platforms with national leaders. Success is a series of saying, Yes! to what you want. What are you saying, “Yes” to? I love this time of year. It’s the heightened awareness and mindfulness of our behaviors and the compassion shown toward others that brings me great joy. As I observe people moving about, I can see and feel their excitement, anticipation, and gratitude. I know everyone has their feelings and reasons for feeling the way they do, but for me, it’s knowing that God’s love for us has no boundaries, barriers or conditions. Wow! To think and with absolute certainty believe that God loves us and only wants good for us. Goodness that we are often challenged to give to ourselves–and don’t have the courage to give to others. Hence, reducing the likelihood of success. Embracing that reality and truth reminds me that I have more spiritual work to do to become the most authentic expression of Christ’s love. What an awesome opportunity! * What will ring true in your heart about yourself and your journey? * What will you be willing to admit you need? * What will you have the courage to ask for? For me, I want to snuggle up with acceptance. To be present moment-by-moment with consciousness and understanding that whatever is happening is for the greater good of everyone’s life experience and learning. By doing so, I expect to gain greater freedom, clarity, and spiritual insight. After you make your vow, don’t forget to assess yourself regularly, and regroup when necessary. Here’s to a Merry Christmas and a year full of delightful surprises that bring you joy, peace, and measurable growth. © 2018 S. Renee, a nationally recognized Self-Esteem, Branding & Communications Expert, Speaker, Coach, is a workplace expert and SHRM Speakers Bureau Presenter. She is the author of Self-Esteem for Dummies, 5 Steps to Assertiveness: How to Communicate With Confidence and Get What You Want, The Bridge to Your Brand Likability, Marketability, Credibility, Our Hearts Wonder Prayers to Heal Your Heart & Calm Your Soul, There Is More Inside: Personal Essentials to Living a Power- Packed Life. You can learn more at srenee.com. WORKPLACE BULLYING: WHY AND HOW TO STOP IT—NOW! I remember feeling tired, just worn out. I didn’t feel like fighting anymore. It wasn’t worth it. The “boss” had won. She could replace me with someone, anyone she thought could do the job better. The daily struggle to do my job, prove myself and keep my staff inspired in a toxic work environment while navigating her unpredictable bully tendencies of condescending, disrespectful, unwarranted jabs and humiliating comments in front of others, had taken its toll. But, I wasn’t completely defeated. Despite the unbelievable pursuits and intimating tactics of my supervisor, the president, and his executive assistant to get me to sign their pre-written letter of resignation, I refused. Not a chance. If you want me to go, then look me in the eyes and tell me. Say it! Say, “You are fired!” No one had the courage to say it to my face; instead, my boss slipped a letter under my office door. According to some stats, I’m just one of nearly half of all American workers who’ve been affected by workplace bullying. As a direct target, I witnessed firsthand how being bullied affects morale, productivity, absenteeism, retention, succession planning, and employee health—including my own. This recognition fueled my purpose, passion, and mission to influence how people feel about themselves and how they communicate with others. I knew that self-esteem, branding and effective communications were platforms to help me move past bullying, as well as pillars to improve behavior and workplace performances. After all, given my success in helping to transform hundreds of workplace cultures through employee development and becoming a go-to media expert, I felt a sense of satisfaction. Plus, being sought by major publishers to share my philosophy, reminded me I was on the right track. However—there was a heighten truth and awareness that flowed through me as I read a written apology from my former boss admitting and owning her internal struggles when she was responsible for creating opportunities for me to develop and grow so that I could provide greater value to the organization—but instead harassed and then fired me. As a workplace expert and speaker for the Society of Human Resource Management (SHRM) Speakers Bureau, it brings me to a great place because back then when I needed human resources, my HR office had no power, no influence, no say. professionals are in the C-Suite speaking the truth, cultures will change, employees will advance and businesses will grow and evolve beyond expectations. Become the Hub for Organizational and Employee Progress: Get leadership’s attention by connecting and communicating how a problem is hindering the CEO/President’s goals. Then, advocate for change. I don’t ever remember reading a workplace policy handbook in its entirety until I needed to know the views and policies of certain behaviors. And, as a workshop presenter, when I’ve asked employees if they’ve read it, few hands are raised. What I discovered is leadership’s behaviors are the “unwritten rules” of the organization. In the eyes of the employees and leadership, when bad behavior goes unchallenged it’s because “human resources” isn’t doing its job. Think Under Cover Boss: I can’t tell you the number of people who email or phone me to share that they work for a toxic boss and are frustrated because human resources will not help. I’ve sat at the table in the C-suite and I’ve learned this: the CEO or president of the organization is looking for solutions to problems that they are too far removed to see, but are very clear these type of challenges have a drastic effect on the organization. Be the voice that confidently and courageously speaks up. I launched my business in September 2005. In my blog, How I Landed My First Paid Speaking Gig and You Can Too I shared with you that, even before I launched my speaking business, I had landed my first paid speaking engagement. But what happens after the first gig? How do you continue to grow your speaking business? I’m a believer that one speaking engagement should lead to another. And there is evidence that, when you give a dynamic presentation that meets the needs of your client, you’ll be booked again and again. However, even when some buzz is created after you speak, there may not be an immediate need for your services. So what do you do in the meantime when you have a relevant message that solves a problem, but your phone isn’t ringing? Some people recommend cold calling. This is, undoubtedly, an excellent way of creating awareness around your brand and the solution you provide for an organization. However, for me, when I first started my business, cold calling was not an option. I hated cold calling, and I still do. I’m uncomfortable picking up the phone, calling an organization and praying that, eventually, I’ll get to talk to someone who will talk to me. This doesn’t mean it’s not an effective way to grow your business. In fact, I help my clients who choose to cold call, craft a message that helps them to connect and communicate what the do and the value they bring in such a way that gets them to the decision-maker. But it’s just not the way I have been able to work with over 100 organizations across nine industries and have a repeat client base of 95 percent. So how did I sign my next contract? It’s September 2005. I just launched my business. I am at an event and recognize the president of a local university. My immediate thought was: “Aha! A potential client. I can help them. I should go and introduce myself.” The more I thought about the possibilities, the more pumped I became. Suddenly, it hit me. I have to talk to him. What should I say? What will make him want to hire me? Of course, when the leader of one of the largest employment organizations is in the room, I’m not the only one wanting his attention. It seemed everyone in the room is vying for his time. I battled so long within myself until the announcer said, “Please begin to make your way to your seats. The program will start in two minutes.” Has that ever happened to you? You talk yourself in and out and in and out again, of taking action? Before my conscious thought caught up with my movement, I made a mad dash toward the front of the room and found myself standing in front of him. All I can remember is feeling anxiety, talking fast, selling hard and trying to put my business card in his hand. Can you relate? Clearly, that’s not what I would recommend to my clients today. Still feeling the residue of anxiety—along with a renewed sense of excitement that they “need” me—I confidently, but hurriedly made my way to my seat. I couldn’t believe what just happened. That moment led to an $8,000 contract a few months later and six consecutive contracts in six years. Plus, my first book There Is More Inside: Personal Essentials to Living a Power-Packed Life was designated their freshman must-read for two years. I didn’t know that answering the call in that moment would be so pivotal in my personal growth and business success. Build Your Brand. A well-built brand creates buzz. Buzz increases awareness and awareness is a touch point. A touch point comes in many forms. For example, a conversation among two or more people and your name comes up, an interview on a local television show or an article in the newspaper or a promotion about your upcoming book signing. And, of course, social media has given us the opportunity to connect with hundreds of thousands of people. Every touch point gives you a chance to be relevant and to climb to the top of your audience’s mind. Small Steps; Big Opportunities. The challenge I faced back then, and sometimes now, is taking the step. Yes, today each step I take involves less risk of rejection because people are more likely to have a positive response to proven success, but the point is this: I still have to take the step. Wherever you are on your journey, you have to take the step. I don’t know how the president of the university knew who I was back then, and I still don’t. But I know this: never underestimate the work you are doing and who it is reaching. Follow up. This isn’t just about landing a new client or developing an important business relationship at work—it’s about the credibility of your brand. Do you do what you say you will? Let’s say I assumed the president was just blowing me off, but didn’t want to appear rude so I decided not to follow-up. Think about what I would have lost. What about you? How many people have you meant, promised you were follow-up with them, but haven’t? I have to constantly remind clients and employees alike—stop making assumptions about others and what they will or will not do. Be honorable in your commitment—this will force them to tell you what they really want from you. And, yes, sometimes they may want you to stop calling them, but don’t be disheartened. Knowing their true desires is important. Surely you want to invest your time, talents and abilities in people and organizations that want them and will value you, right? © 2018 S. Renee Smith-Larry. All rights reserved. S. Renee helps professionals around the world increase their income and influence by becoming more likable, marketable and credible. As a nationally recognized self-esteem, branding and communications expert, speaker and coach, she also is the bestselling author of: 5 Steps to Assertiveness: How to Communicate with Confidence and Get What You Want, The Bridge to Your Brand, Our Hearts Wonder, There Is More Inside and Co-Author of Self-Esteem for Dummies. For coaching or booking information call 888-588-0423 or visit www.srenee.com. It was 2005 and I knew I was being called to be a speaker. In fact, I had known for about 7 years that I would be a speaker. Nope! I didn’t have all the details. I didn’t know where to start, who I needed to talk to or exactly what I needed to do to get started, but I did know two things: I wanted to change the workplace and I wanted to see people succeed. Without intentionally exerting any energy, my heart rate increased and I had so many thoughts running through my mind that they disrupted my normal thought pattern. Have you ever had that happen to you? You’re so surprised by an opportunity that you don’t know what to think, do or if you are even capable of meeting the expectation? At that time, I wasn’t a proven speaker and I certainly wasn’t ready to step on stage in such short notice. My first book was about discovering who you are and finding the confidence and courage to be personally accountable for creating what you want. That just didn’t seem to be a great topic for a group of policy-following HR professionals. Although I wasn’t going to get paid and didn’t have the experience to know how to process what I could possibly get out of this gig, at the very least, I wanted the audience to like my presentation—and like me. It wasn’t just me, right? Don’t you want to be liked and appreciated? It turned out that I was completely wrong about HR professionals. Everyone started buzzing about the content. After the applause had ended, a line started forming. People were saying how inspired they were by the content and how much this message was needed in the workplace. “Wow!” I thought. “They must really mean what they are saying,” Do you ever feel like people are just appeasing you? You know, they don’t want you to feel bad so they tell you how great you are, but never take your follow-up call. Well, despite the buzz I didn’t absorb it as honest feedback. Clearly, wanting me to keynote his conferences, he retorted, “I can pay you $1,000 per conference for 45 minutes.” It didn’t take me long to make that decision. I had just spoken for 30 minutes and got paid $0. He’s offering me $1,000 for 45 minutes, plus I quickly assessed that if I revved up my efforts, I could have my book done before the conference. I boldly asked, “I have a book coming out around that time. “Can I sale it after I speak?” He enthusiastically said, “Yes!” I had just negotiated my first speaking contract and gave birth to my full-time speaking career. From coaching over 300 speakers in the last five years, many of them spend years investing their time and money speaking for free or for minimum compensation. My philosophy is this: be careful of setting a standard of devaluing your mission and message. Over time, not only will you be speaking for free, you’ll start to question yourself and the value you bring. This can severely impact your self-esteem. · Be Yourself. Many speakers, authors and other professionals, including employees struggle with knowing and really believing in themselves and their message. Do your homework and just present your message; don’t try to prove that your message is right or how great you are. · Be Honest With Yourself. Recognize that if you are not being booked, you may need a coach to help you develop your brand, speech and speaking abilities. Your presentation has to be so good that you are memorable! · Brand Your Business. I’ve discovered that for most of my clients, there is an internal battle of wanting to craft and communicate an authentic, valuable message and trying to figure out what’s most popular in the marketplace. Don’t bounce around trying to be everything to everyone; believe in and evolve with your message as the market and workplace changes. © 2018 S. Renee Smith-Larry All rights reserved. S. Renee helps professionals around the world increase their income and influence by becoming more likable, marketable and credible. As a nationally recognized self-esteem, branding and communications expert, speaker and coach, she also is the bestselling author of 5 Steps to Assertiveness: How to Communicate with Confidence and Get What You Want, The Bridge to Your Brand, Our Hearts Wonder, There Is More Inside and Co-Author of Self-Esteem for Dummies. For booking information call 888-588-0423 or visit www.srenee.com. DO PEOPLE KNOW AND UNDERSTAND WHAT YOU DO? Recently I had an Aha Moment! I can’t believe that I missed this. But I think you’re going to find this to be one of your greatest blind spots, too. As experts, we often assume people “Get it.” They know what we do. And, if they don’t, they should. Why shouldn’t they? There’s tons of information out there about our subject matter and we saturate them with the value of our work, right? Here’s what I learned during a one-on-one fact-finding consult with a new potential client. It has helped me shift again how I position my message. S. Renee: Tell me about yourself. Potential Client: I don’t know if I need your services because I don’t know if I need branding, but you came highly recommended so I thought I’d at least give you a call. A publisher published my book and I want to sell lots of copies. S. Renee: Oh, that’s exciting. So you signed a book deal. What an honor! Who is your publisher? Potential Client: Oh, I paid to have it published. S. Renee (Hmmm, I thought to myself): Okay. Tell me more. Potential Client: I realize now that I paid too much money for the little bit of work they did for me, and now they are trying to sell me a marketing package. So I’ve been asking people about marketing, and your name keeps coming up as someone who can help me. I thought I’d call to see if you could help me sell copies of my book. S. Renee: Tell me more. Potential Client: I know my book will help a lot of people. I just need for people to see it and I know they’ll like it and buy it. Renee (after some more digging): So, tell me what you know about branding. Potential Client: I think it’s when people recognize you. But I don’t want to be recognized. I just want to sell my book. That’s when the light bulb came on for me. This individual, like many of the people I talk to, has a dream. They finally have a piece of their dream in their hands, but they don’t know how to launch it into the marketplace. In fact, they don’t even realize their book is a product and it has to find its position among the millions of other books in the marketplace. Yes, they see Fortune 500 companies reach them through storytelling on television, billboard and online advertising, and store placement. But they don’t connect their product with needing the same investment, attention and persistence. Like many of the over 300 clients I’ve coached, their ideas are on paper, but they don’t see their book as an extension of themselves. They see it as an independent product that only needs to be seen by others, and – BAM – they sell hundreds of thousands of copies and they become well-known! This is so far from reality. Consumers are sophisticated and smart. They know what they want to spend their money on, but you have to tell them you are the person or company who they want to spend their money with. Brands drive sales. It’s the skillfully worded message behind the product and the consistency of that message that gets people’s attention. It’s the fulfillment of the promise of that message that earns the trust of the consumer, which leads to a purchase. Think about the advertisements you see. They are nothing more than a carefully crafted story that shows you a problem and tells you how to solve it. As small business owners, entrepreneurs, speakers, authors and even employees, we too, have to craft our message, build our story and earn the trust of our audience. 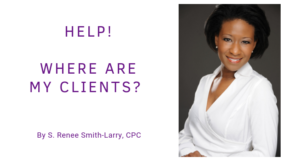 S. Renee, CPC, is a nationally recognized Self-Esteem, Branding and Communications Expert, Speaker, Coach and Best-Selling Author. 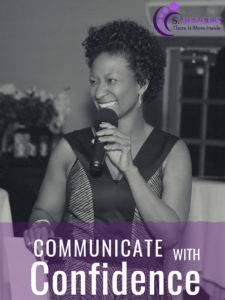 To learn more about how you can craft and communicate a message that connects and engages your audience visit www.srenee.com and consider one of her upcoming events. I remember feeling tired, just worn out. I didn’t feel like fighting anymore. It wasn’t worth it. She had won. She could replace me with someone, anyone she thought could do the job better. The daily struggle to prove myself, do my job, keep my staff inspired in a toxic work environment plus navigate her unpredictable bully tendencies of condescending, disrespectful, unwarranted jabs and humiliating comments in front of others, had taken its toll. But, I wasn’t completely defeated. Despite the efforts of my boss, the president and his executive assistant scheming to get me to sign their pre-written letter of resignation, I refused. Not a chance. If you want me to go, then look me in the eyes and tell me. Say it! Say, “You are fired!” They didn’t have the courage to say it to my face; instead, my boss slipped a letter under my office door. I laugh at that cowardly behavior today after reinventing myself, receiving a written apology from my former boss (that wasn’t slid under my door) and becoming nationally recognized for my work, but that experience was mental and emotional torture when I was going through it. It wasn’t a small feat to reinvent myself and design a brand that would catch the attention of major corporations, media outlets, and publishers. There were a lot of decisions I had to make before I could land my first gig, media interview or book deal. Reflecting on that time in my life, I realized that I had already seen the vision that I’d be doing something other than serving as Director of Public Relations. I had written in my journal exactly what I believed God had spoken to me. Deep down I knew the truth, I just couldn’t own it at the time. The truth is, at that time, I didn’t have the courage and confidence to stake claim to my space in the world. Isn’t it ridiculously sad that we are so fragile? Unfortunately, we replace our God-given powers for our fragile insecurities. All I had to do was say: Yes! to the vision, God had shown me for my life. Yes! to the possibility that the image in my mind and the feeling in my heart were the truth, and understand that the doubts running through my head were a lie. Yes! to the belief that if I put myself out there, I’d be supported by the spiritual world. I’d meet people on my path that would appreciate what I was trying to create and help me, and I would appreciate and support them. Click the title to watch a video to understand what my trademark message, There Is More Inside is all about. Remember, when I left my job, I was broken and feeling lost. Okay, maybe more intensely disappointed in a system that failed me than broken, but the point is this: they robbed me of my livelihood for no good reason–and didn’t care. Decide what you want to give the world. For me, I want every person to know they have the right to feel good about who they are and create the life they want by practicing spiritual principles and building a brand. Write down your vision. I wrote my vision down in my journal years before landing the Director position. I knew I desired to become nationally known by writing and traveling the world teaching people spiritual principles and how to own their truth and courageously live it by being personally accountable for their life. Put your pride aside. I earned great success during my 20s. In my early 30s, after being fired, I was without income, but I was trying to pursue my purpose. As a result, the debt was rising and my stress level increasing. I put my pride aside and took a job as an assistant manager at WalMart. Yes, people were asking, “What happened?” They were wondering what happened to me because I was on the fast track to success. I didn’t explain myself. I stayed focused on my target. No good could come from engaging in conversation with people who would only keep a negative conversation going and give power to my doubts. By staying focused, I created the spiritual space for me to work on writing my first book, There Is More Inside: Personal Essentials to Living a Power-Packed Life. This would’ve been difficult if I would impose more suffering on myself. Reflect on your life. By pausing and thinking about your life’s journey, you’ll notice themes and messages that allowed you to clearly see a marketable message that will resonate with people. Crafted a brand message around your life challenges. I used my story and the lessons I learned to craft a message that related to national issues and solved problems. You can do it too. Decide what image you want to project. As a former model and television talk show host, I understood the importance of image and how it influences people’s perception of you and how they respond to you. I wanted to make sure that when the spotlight finally made its way around to me, I would be ready to showcase and clearly communicate my value to others. Attend workshops. You don’t know what you don’t know, but I knew it was important to find out what I didn’t know so I attended conferences and workshops, which gave me the opportunity to watch leaders in the industry, learn from them and make myself known to them–even though I was still marinating on who I was going to be in the marketplace. Put into action what you learn at workshops. Attend workshops with the intention to learn and implement what you learn immediately. By doing so, this commitment served as the building block to my business and helped me to grow steadily. Hire a coach. I hired a personal and business coach. I needed to understand what may hinder me from reaching my goals and identify any blind spots. You’d be surprised what can happen and how much you’ll grow from getting a proficient coach. Launch your newly reinvented brand into the marketplace. In September 2005, approximately 3.5 years after being fired, I launch my business. In the last 13 years, I’ve had the good fortune to work with over 100 organizations over 9 industries (95 percent are repeat clients), coached approximately 300 small business owners and employees logging over 600 hours, be interviewed by some of our nation’s top journalists and signed two book deals. some of the nations most influential leaders. What’s most important? I have been able to wake up every day and be used by God. I’m not sharing this with you to impress you, but to impress upon you what can happen when you DECIDE you will no longer be filled with doubt, but fueled by faith! How about you, what’s happening in your world? What are your challenges? What needs to change? What are you willing to change? Are you pursuing the vision God has given you? If not, why not? 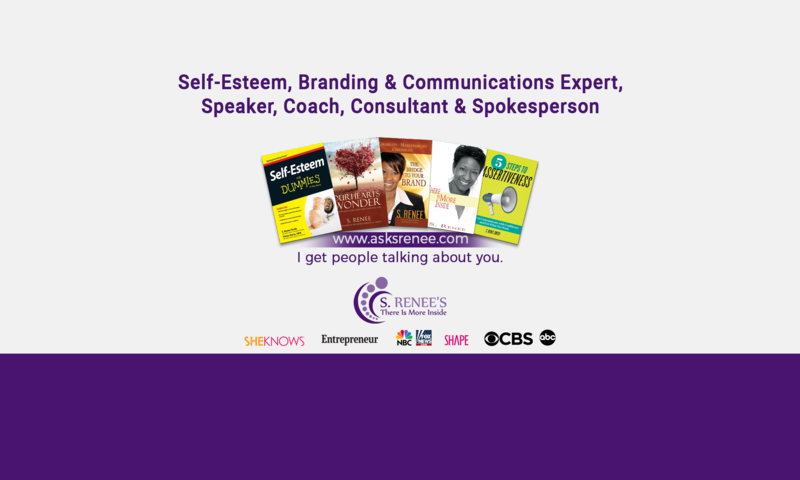 S. Renee is a Certified Professional Coach and a nationally recognized Self-Esteem, Branding & Communications Expert, Speaker, Coach & Author. She is the author of Self-Esteem for Dummies, 5 Steps to Assertiveness: How to Communicate With Confidence and Get What You Want, The Bridge to Your Brand Likability, Marketability, Credibility, Our Hearts Wonder Prayers to Heal Your Heart & Calm Your Soul, There Is More Inside: Personal Essentials to Living a Power-Packed Life. You can learn more at www.srenee.com. Don't miss a post. Sign up now. S. Renee on Who Is Your John the Baptist? petra jermaine on Who Is Your John the Baptist?